Allows you to play more quicky and precisely with your mouse and keyboard on the PS3, PS4, XBOX 360 and XBOX ONE. Easy and simple plug&play thanks to optimized default setting - Supports the headphones to output the background music and online chat on PS4 - Supports the vibration function. A sole customized wrist strap makes you feel the real vibration. Two options for the Key Programming: by Converter or by PC. You can easily change the key configuration by your PC computer or by our converter directly. 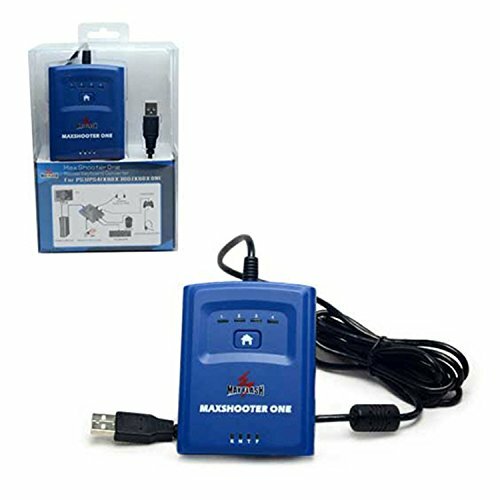 Provides great reactivity when playing ego shooter games. 9 different speed levels selectable for the mouse. 9 selectable sensitivity adjustments for optimum precise setting dependent on the mouse and game. All buttons of the PS3, PS4, XBOX 360 and XBOX ONE controller can be assigned as desired on the mouse and keyboard. Up to 11 different button assignment profiles can be stored at the same time. Thanks to the 11 freely programmable profiles, even games with different control can be played identically. Adjustable turbo and auto fire function for quick,automatically repeated activation of a key. Many other optional settings possible(e.g.reversing the Y-axis of the mouse). Support the data update - The newest game confilgurations and hardware compatibility will be updated on our official website.